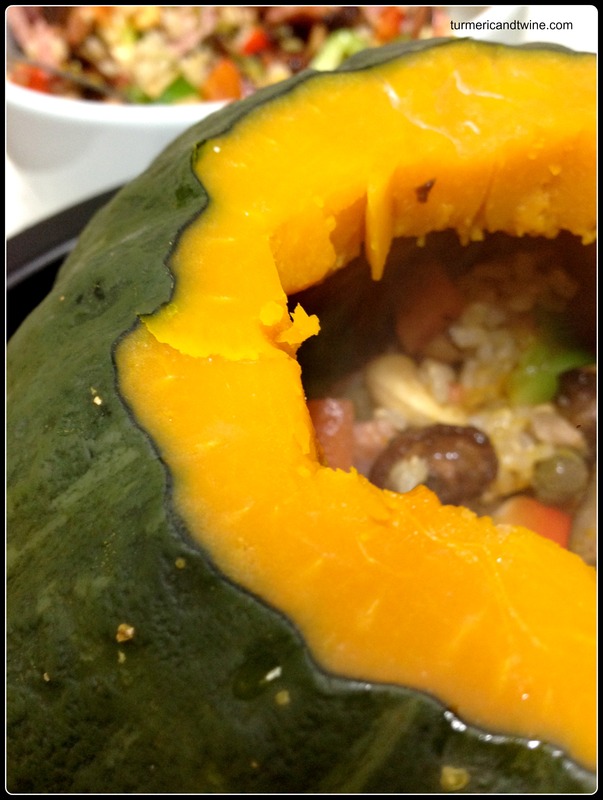 I first started getting the craving to stuff a gourd when the fall harvest hit the markets here in Seoul. The orange pumpkins are a bit different from the ones I’m used to in Canada. They are also harder to find, expensive and too massive for my little kitchen. 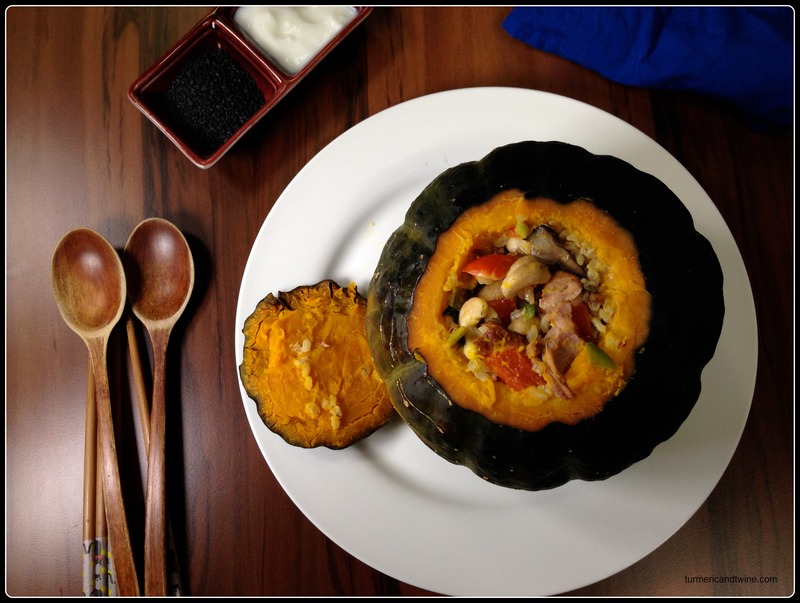 I settled for a delightful kabocha squash (dan hobak) that can be found everywhere at this time of year. They can be found in a variety of sizes, too, from tiny to medium large. This excites me to no end. I’d love to have a dinner party and serve a tiny pumpkin to each guest (heehee!). Smoked duck is readily available here in Korea, so as one of my favourite meats, I chose to stuff my gourd with it. It adds an excellent smoky quality and flavour to the mixture, as well. I removed most of the skin and fat before adding the meat to the mixture in order to render it. Duck fat has a gorgeous flavour that is highly complimentary to many food items. I’ve tried to substitute it with pork fat when cooking shiitake mushrooms, for example, and found myself disappointed with the results. Rendering is incredibly easy. Simply collect the fat, cook in a pot on low heat until the fat is clear and strain into a jar for refrigeration. Once cooled, it should be pure and white. The fat should keep for 2-3 months. Use in place of oil or to add flavour. The Szechuan pepper is a curious spice. Despite its name, it is not closely related to, nor has much of the hot spicy quality found in the Piperaceae family (such as black pepper). In fact, its genus belongs in the citrus family. It has a sharp, bright flavour, which is known to enliven food. It is also known for its numbing feature. Moments after putting one of these husks in my mouth, I was hit with an odd numbness I’ve never quite experienced before. These peppers are perfect for this dish because of how well they bring out all the flavours. Rinse rice two or three times by splashing around in water and draining. Finally, add two cups of water and place over high heat in a pot or rice cooker. Once it starts to boil over, turn heat very low for 20-30 minutes. My little test to check if the rice is done without stirring is to tip the pot slightly. If the rice slides or moves in any way, it needs to cook longer. If the rice doesn’t move, it’s done. 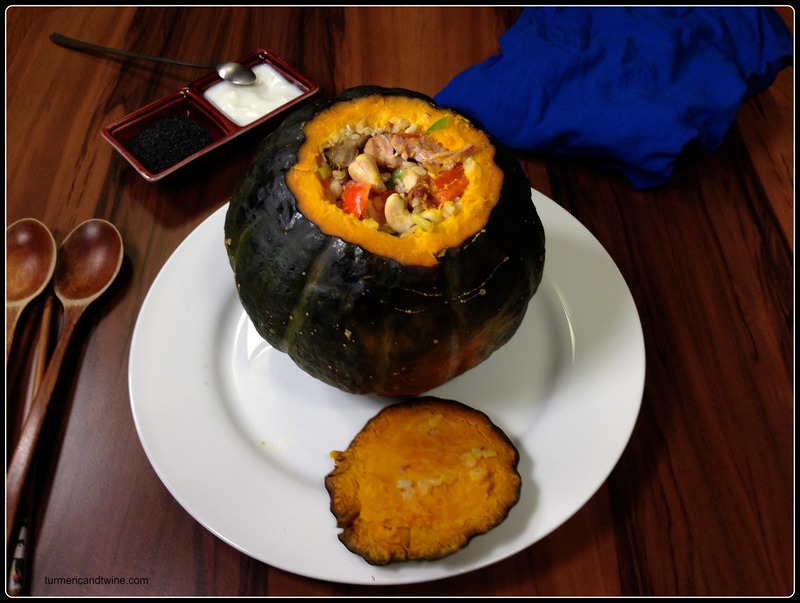 While rice is cooking, fill a large pot with enough water to submerge your pumpkin(s) and bring to a boil. Cut the top off the gourd(s) and remove the seeds and gunk. Once water is boiling, carefully lower into the water, including the top. Allow it to boil for 15 minutes. It should be soft, but firm enough to hold its shape. Drain water and carefully scoop out the gourd. Place in the refrigerator to cool. Heat a dash of cooking oil in a frying pan and brown the garlic and chilies. Add the mushrooms and fry until the mushrooms have released their water and have reached a modest golden colour. Preheat oven to 350ºF/180ºC/ gas mark 4. In a large bowl, mix all ingredients except pumpkin, butter and milk. Mix. Pour excess water that might have pooled in the pumpkin and begin stuffing with the mixture. Once filled, pour in the milk to fight possible drying out. Top with butter and replace the pumpkin top. Bake for 25-30 minutes. 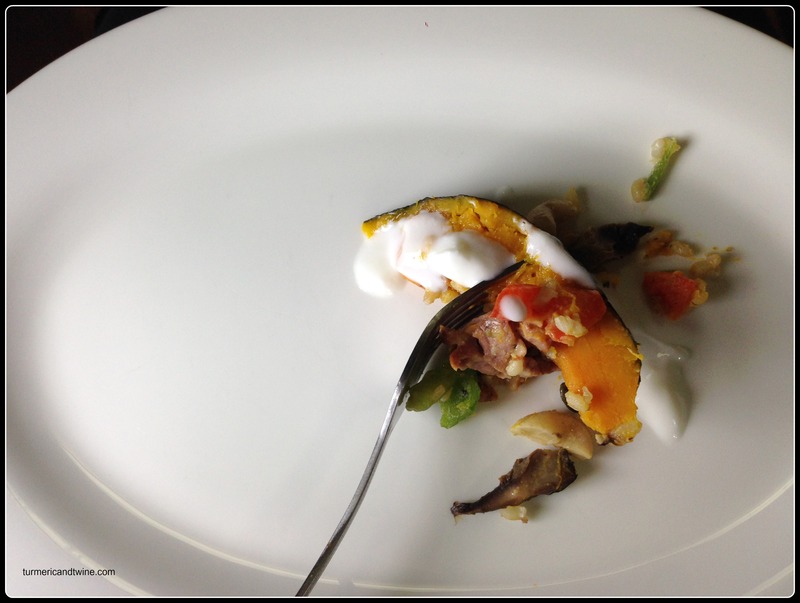 While it is baking, clean your messy kitchen and think about how hard you will eat your stuffed pumpkin. 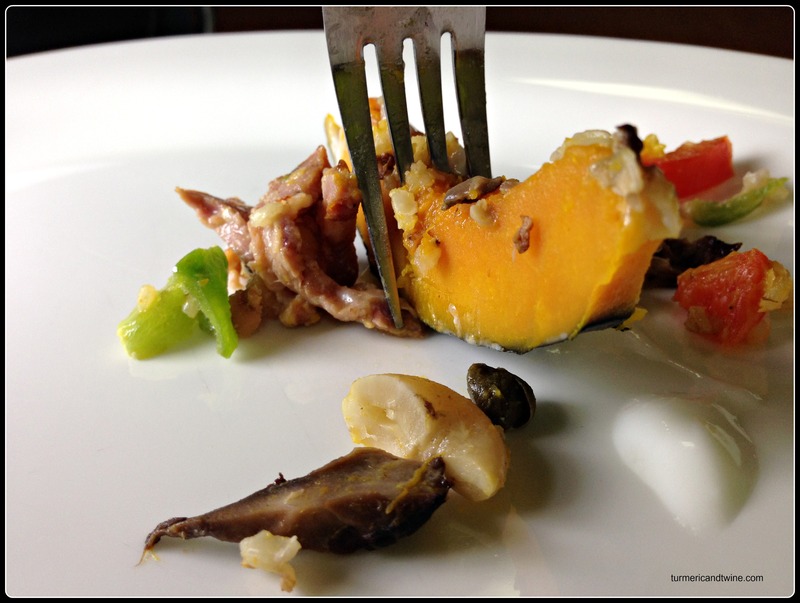 Because you boiled the pumpkin, you can eat all of it, including the skin. Do this very thing.